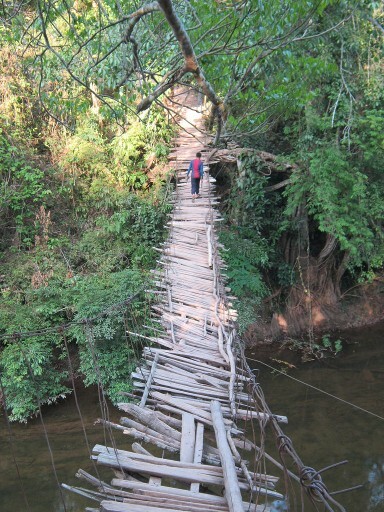 Above, a rickety bridge over the Nam Tha river in Laos! NB, the bad news: Walkers beware, the river is infested with crocodiles. NB, the not so bad news, the crocodiles are the Siamese crocodile (Crocodylus siamensis) – a small to medium-sized freshwater crocodile native to Indonesia (Borneo and possibly Java), Brunei, East Malaysia, Laos, Cambodia, Burma, Thailand, and Vietnam. The recent death of Sir Gerald Kaufman the “Father of the House” [of Commons] means that there will shortly be another by election in one of Labour’s northern strongholds. Sir Gerald famously labelled his party’s 1983 manifesto as “the longest suicide note in history”. Of course, in that manifesto, Labour called for Brexit! For UKIP this brings up the question of who if any shall be the party’s candidate? What is clear is that the unfortunate Mr Nuttall is now a liability due to the problems with statements vis-à-vis Hillsborough and possibly, other statements as well. Whether or not Mr Nuttall was directly or indirectly responsible for these discrepancies, matters little. The FACT is that Mr Nuttall is now “holed below the waterline” and is sinking in terms of his potential support amongst the members of the voting public. UKIP is in a very difficult position and may very well cease to exist. That would be a very great shame for a party that supports the idea of the lawful constitutional government of the UK and not having the government leased out to Brussels! UKIP’s principal problem is that IF it’s demands vis-à-vis Brexit ever get carried out, the consequences would be catastrophic! Therefore UKIP can ONLY survive IF it’s demands vis-à-vis Brexit NEVER get carried out! Therefore, the strategists at UKIP have to plan the party’s future in relation to what might happen vis-à-vis Brexit. In other words, work out how to cross bridges before they are reached. 1. Flexcit – aka “the Transitional Arrangement”. 2. Crash Brexit followed by retroactive cancelled Brexit and continued current EU membership. 3. Crash Brexit followed by emergency EU+Eurozone membership. 4. Cancelled Brexit after a second referendum which reversed the decision of the first. Which bridge shall be crossed? If it is #1, then UKIP will survive in a reasonable form by advocating a future outside the EEA. If it is #2 or #3, then the crash Brexit will destroy UKIP. If it is #4, then UKIP will barely survive by advocating a future outside the EU.